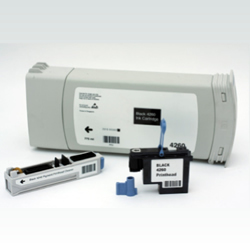 Hp® developed an universal water-based ink quality for its cartridges and ink tanks for the automatic and continuous ink delivery system for professional printing barcodes, addresses, logos and numbers. Printhead universal BLACK 4260: dye based ink that exhibits long open or decap times and meant for regular and some coated (porous and semi porous) substrates. It will dry quickly and give good permanence on coated stocks, while maintaining excellent print quality and a dark image on non-coated stocks. In some cases like printing on film - for instance for film wrapping machines - or glossy paper, an additional infrared drying unit would be advised. The necessity it these drying units can be only determined by testing. Bulk universal BLACK 4260: 775 ml ink tank for the automatic ink delivery system and it is provided with a microchip control device. Printhead cleaner IPAS: The set-up time of the IPAS system is very short due to the automatic cleaning cycle of the print heads. This short set-up time minimizes standstill of your finishing equipment.